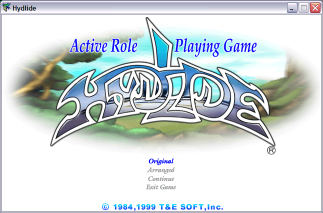 My initial preconceptions about Hydlide was that the game stank. Upon trying this, they were reaffirmed. Then I read the docs. I proceeded to have a decently fun amount of time with a fairly aimless Ys-like game, once I figured out I had to change my character to “Attack” mode for him to actually, you know, hurt the enemies. Then I hit level 3, and half the enemies stopped giving me experience, while the other half continued to kill me in one hit. And I stopped, nearly frustrated back to my initially reserved opinion. So! In Hydlide, you’re this guy Jim, and you run around killing things, looking for three fairies, three jewels, and a big bad demon guy to kill. Hey, it’s not particularly deep, but it’s an old game, so it’s excused. The total lack of any aim is a real problem, though; I constantly found myself going one screen too far in what was apparently the wrong direction, and getting reamed by monsters. Your mileage may vary.